12/8, November 1897-14/9, December 1899. $2.00 a year, 64 pp. This was an organ of the Katherine Tingley branch of the Theosophical Society, continuing the volume numbering of the Path and Theosophy. As with all of the journals, in the Tingley line of succession, it was very well produced with high quality photographs. Contributions by James M. Pryse, Cyrus Field Willlard, Alexander Wilder, Neresheimer, Henry T. Edge, Herbert Coryn, Katherine Hilliard, Tingley, J.H. Fussell, Basil Crump, and other notable Theosophists of the period. Rowell’s American Newspaper Directory for 1900 says the journal was claimed a circulation of 4,166. LOC. 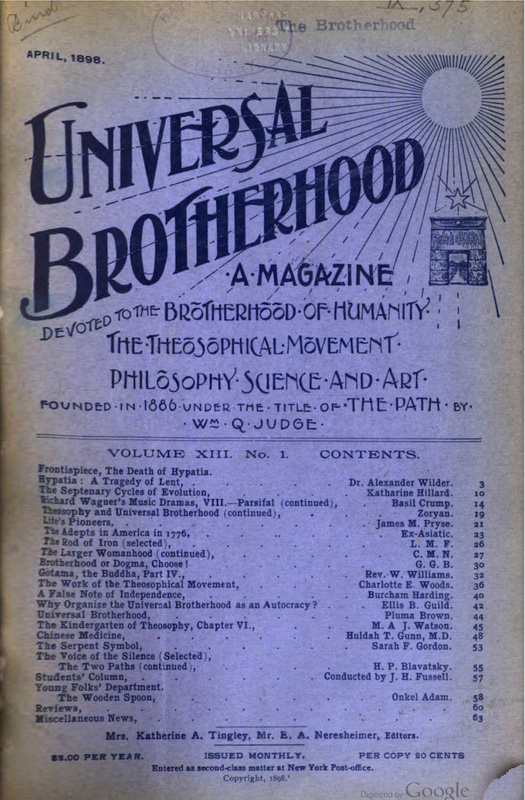 Some of the issues below were sourced from the Universal Theosophy web site.